I also have a hundred holes. And since becoming a mum, I’ve discovered a few more too, but I know about them and that’s the key. Self-awareness. And fitting in? Well, that’s overrated! Thank you for the comment, Stix. I definitely hope the social worker values self-awareness as much as we do! You could have been writing about Bumble and I. He is my anchor. I gave up trying to fit in a long time ago. I have many holes and have been described as ‘abbrasive’ and a ‘tough nut to crack’ I love your description “the charming face of trauma”. It is face I where daily. Thank you for your comment, honeymummy. It’s always reassuring to hear from people with similar experiences, especially those who have gone on to adopt. I enjoyed discovering your blog! I recognise myself in you, wishing for the world to all get along. I think you will find that social workers will or at least should greatly value your self awareness. By knowing how to identify emotional reactions of your own means you will be able to help a little one recognise their own. I think this is a massive strength to have as an adoptive parent. 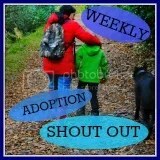 Thank you for Sharing on The Weekly Adoption Shout Out. Thank you for the support, thepuffindiaries. I hope that our social worker recognises and values this. We have our vulnerabilities, but I do feel they are balanced by our strengths. It’s the parents who think they have it all together that I worry about. You will do just fine and some little person will be blessed to have you as parents. Thank you for your comment, SerialAdopter — I worry as well about people who think it’s all in hand!